Hello and welcome everyone to another edition of Graps and Claps, which was supposed to take me on a trip to Bolton for PCW but due to the venue where it was taking place forgot to fill in some very important paperwork thus meaning they couldn’t run the wrestling on Friday night, my plans changed meaning I diverted 10 minutes to one of my favourite stamping grounds in the form of GPW’s Crazy Cruiser 8 which on paper the faithful could see the coronation of what has been a breakout year for Sandy Beach! Arriving in Hindley for 625 p.m after once again another delayed train journey, we first took to local drinking establishment The Hare and Hounds which had the usual locals hogging the bar and the 3 beautiful doggies lounging around the fire – this is a proper homely place. Only one drink here which was one I had had once before in the form of Papa Jangles Voodoo Stout (4.5% £2.70) that was a smooth tasting drink to start proceedings as we made the walk down the street to the next bar being Korre which is the local cocktail/wine bar of Hindley, now since I last reviewed this place they have since grown a range of cask & keg ale on tap with a (£3.20 4.5%) Chocolate Fudge Milk Stout being a well chosen drink of choice, with the added thing of a loyalty card that if you buy 10 pints you get the 11th pint free, meaning we will probably be going in again. Walking into a sharp shower, we made our way to the venue for the evening’s action and on first look I would say the attendance shows no way of reducing with around 175/200 packing into the Rose Club for GPW’s final show of the year. As I got my seat ready, a glancing look to the bar was had and what is this I see – THE WIGAN PIE IS BACK!!! As we would find out though actually ordering one would end up lasting longer than a Baron Corbin opening promo on Raw. 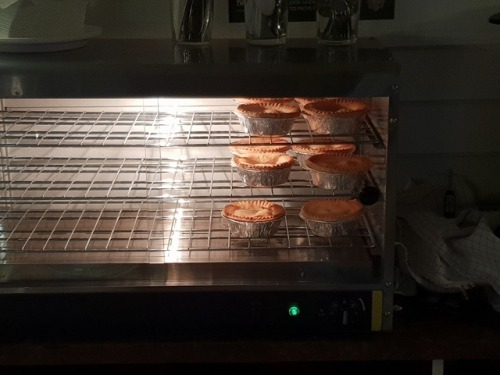 The issue with the pie was that they weren’t the right temperature with the lad behind the bar constantly checking each pie with a temperature stick with the perfect pie needing to be 7 on the stick, but every time I went to the bar with the bar staff visibly getting fed up of my question about when would the pies be ready? The stick would show 6.85 meaning they weren’t fit for consumption!! Even at half time, a certain Chris Egan was having the same issue waiting for his pie and was certainly standing his ground as he waited at the bar for a good 15 minutes in case his pie finally reached the magic 7 figure on the stick, as I made another journey to the bar Chris had finally been served his and our mate Tom as well got a pie but they were the only two ready leaving yours truly sulking into his pint of Carlsberg! Thankfully just as Egan’s review came in from the balcony, the pie gods answered my prayers at the bar and I finally got my Meat and Potato effort which after all the anguish ended up being a solid 8/10 with the flavour being the best part of it, but not a great crust on it! It certainly didn’t help the fact that I saw my mate Tom Slade devour a kebab during the first match from Indian Spice across the road from the venue. So with #Piegate explained, let’s get into the wrestling with a review of the 1 night tournament to crown a Crazy Cruiser champion and also a 10-man tag match in between! After a parade of the entrants in the tournament, we got things going with Isaiah Quinn vs Lana Austin. Quinn who was wearing some new Slate Grey tights to fend off the usual Purple Pants shtick he gets from our section (lo and behold we got a Slate Grey pants chant going). Lana got off to a fast start hitting Quinn with a spinning forearm in the corner and was ready to hit the peach punch but Jacob North got on the ring ropes to distract Austin causing Quinn to attack her from behind and put him in control. Quinn hit a hard clothesline for two and then put Lana in a neck vice to wear Austin down, but after this when Quinn was trying a peach punch of his own Lana escaped and put Quinn’s minion Nick Macguire in her place and such followed a face full of Quinn’s arse in Nick’s face! With the tide swung Lana hit a forearm followed by a swinging neckbreaker for a 2 before hitting the peach punch but somehow Quinn got back into it and was on his way to victory but someone singing the Queen classic ‘I want to break free’ distracted Quinn and it was none other than Matthew Brooks who had finally escaped capture from Quinn this time leading to Austin to capitalise to use a CHEEKY ROLL UP! on Quinn for what we thought was a 3, but only judged a 2 by Fitzgerald but it was soon a 3 count as Lana hit a Tornado DDT on Quinn to pick up the win and advance to the next round! After the match Quinn’s brigade tried to get revenge on Lana and Brooks but they were soon sent packing to the back with the AAAARRRGGGHH Walk of Shame ringing in their ears – very good opener here folks with plenty of action all told. 2nd match we had ‘The Juice’ CJ Banks taking on GPW up and comer Jack Griffiths in a very much wily veteran taking on a young upstart contest. CJ was quite the aggressor early on schooling Jack with forearms and backbreakers to try and break young Jack’s spirit but Jack came back with a somersault dropkick, a springboard elbow and a fantastic looking standing Spanish Fly for a 2 count. 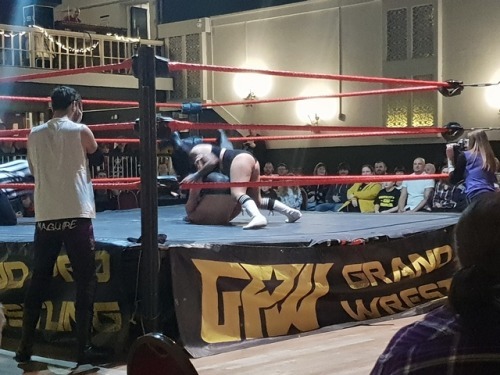 As Griffiths was trying to get the upset victory he went to hit a split-legged moonsault but CJ managed to get out of the way leaving a groggy Griffiths prone for a Bazooka knee from CJ to connect and floor him for the 3 count advancing CJ to the next round in once again a good match. Griffiths though a bit green in parts, certainly has lots of potential to make a name for himself on the scene with shades of a young Will Ospreay shining through for the lad. CJ on the other hand did a great job of giving the lad the shine here, but I have always had this with CJ with him being a very good wrestler but there is something missing in the connectivity department with the crowd. Third match in the Crazy Cruiser 8 was due to be L.A Austin taking on Jett Fashion but this never really got going due to Fashion’s old tag partner Ste “Bin’ Mann getting involved and laying waste to both Fashion and L.A to the boos of the crowd, the result though of this match confused me a bit as it felt like a No Contest but I guess due to Austin being attacked first by Bin Mann this meant L.A got the DQ victory and advancing to the next round – all a bit confusing! Three down and one to go in the tournament with an enticing contest being the fourth and final match with Soner Dursun equipped with a small cup of tea for some reason that hasn’t been explained (answers on a postcard) taking on the red hot favourite Sandy Beach who as ever came accompanied with his trusty inflatable shark leading to the fun as ever ‘Sandy Shark’ chants from the crowd, Early on though Soner had Sandy’s number with a prolonged beat down that was until Sandy came back with a sharp knee in the corner to Soner’s face and then a Sharknado DDT for a two count. Later in the match though, Soner was up top ready to hit a splash to Sandy but Sandy rose to fit a top of the ring but Soner gnawed at Sandy’s ear to in front of the official to send Sandy crashing to the mat, Soner thought he had Sandy beat with a stacked pin but this was reversed by Sandy into a pinning combination of his own to get the three count in a fine contest and advancing to the Semi Finals – Sandy Beach! Back from the break we returned with the Crazy Cruiser 8 Semi-Finals and with it being a blind draw it was interesting to see who would face who from who was left, so with that said we had part 1 of 2 in the ‘Who do we cheer for stakes’ with Lana Austin taking on of all things her Brother L.A Austin which left the crowd torn on who to cheer with your good self siding on Team Lana. An array of springboard arm drags were the order of the day from both L.A and Lana, but it was a spot in the closing stretch of the match that brought a great ovation from the crowd with Lana hitting a tilt-a-whirl face buster to L.A and a springboard ddt, but she tried to follow up with a tilt-a-whirl stunner but was blocked by L.A who hit a springboard cutter to his sister causing both to fall to the mat. Both tried to use a double cover pin, but Lana rolled over at the 3rd second to pin L.A’s shoulders to the mat to advance to the final to face one of the next combatants in the form of either CJ Banks or Sandy Beach. 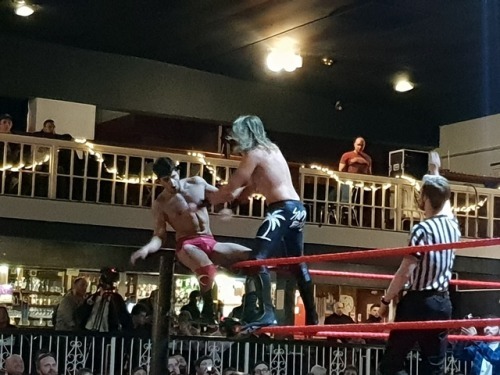 Sandy was certainly the one the crowd wanted to win in his contest vs Banks as we got off to a very technical start with both wrestlers trading arm drags, arm bars and wristlocks as the battle for the advantage took parity in the first few minutes of this match. It was CJ though who got the upper hand on Sandy some very good technical work to wear down his opponent, but Sandy for the love of the crowd made a spirited fightback and with CJ still on top, Sandy managed to catch CJ from behind with a CHEEKY ROLL UP to get the victory to set up a 50/50 match in terms of fan split with Lana Austin taking on Sandy Beach to determine who would be the Crazy Cruiser! 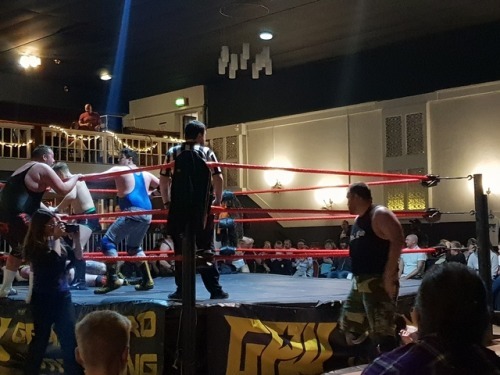 In between the tournament matches we had 10-man tag team action with The Young Guns (Ethan Allen & Luke Jacobs), Rio, Simon Valour & Johnnie ‘Heresy’ Brannigan taking on The Bad Lads, Big Joe, Kameron Solas and Chase Alexander. Even from an early stage, the officials lost control with lots of fighting on the outside which led to dives from Jacobs, Allen and Kameron Solas to everyone outside, back in the ring it was Luke Jacobs who got Chase Alexander in position for Ethan to hit a raised back stabber that was then duly followed up by a running knee from Jacobs to Alexander to get the victory for there team in a fun little match. Apart from the obvious Big Joe standing out, the Young Guns and Kameron Solas are certainly 3 lads you should keep a watchful eye out for, especially Ethan who with a bit more filling out certainly has a Chris Ridgeway vibe about him for the future and could be high up on the cards in the North West for the future. Here we go! The Crazy Cruiser 8 final with the crowd split 50/50 here we go with Sandy Beach taking on Lana Austin. 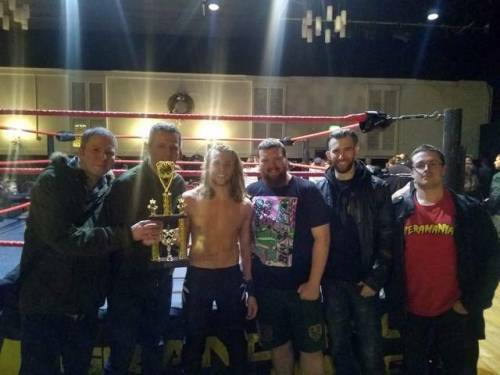 Here I was on side with Lana to take home the trophy, but secretly I wanted Sandy to get the victory here as his story arc in GPW has been great in the last year from loveable loser to a force to be reckoned with. Early on both Lana and Sandy brawled through the crowd, including Sandy running face first into a post near the bar, as they came our way, we were soon scrambling for our pints of Carlsberg as the action got wild! On the other side of the ring Beach looked to throw Austin through the crowd, but Lana came back and gave Sandy a taste of his own medicine sending him sprawling through the chairs. Once we got back in the ring, Lana tried to put away Sandy with a couple of DDTs and a tilt-a-whirl stunner which got a count of 2 and seven-eighths that brought the crowd to their feet in duelling chants of ‘Let’s go Sandy’!, ‘Let’s go Lana’! With the match ready to hit fever pitch, it was Sandy who hit a Powerbomb/Piledriver to Lana to send her loopy and then followed up with the Wipeout Facefront DDT to get the three count in an excellent final to end what was in the end a fine tournament with Sandy probably having the toughest passage beating three of the best in the U.K in the form of CJ Banks, Soner Dursun and Lana Austin. 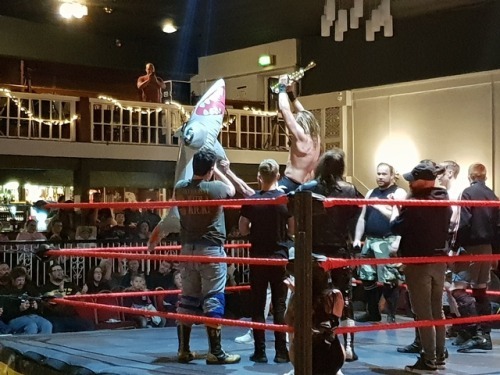 After the match Sandy was presented with the trophy by his trainer Bubblegum making an appearance in the ring for the first time in well over a year since his absence from the squared circle. 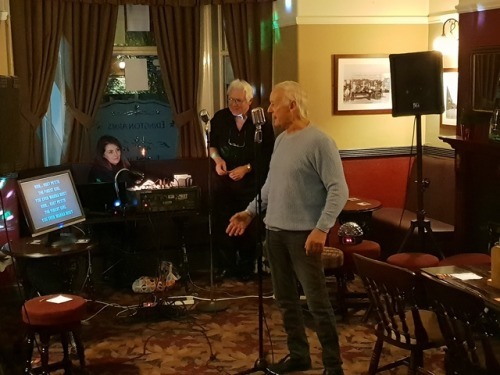 Show done and photo taken with our Champion Sandy Beach it was time to make our way back to the station but not before making a visit to the Edington Arms for a look into what hopefuls were displaying their talents on the karaoke on this evening. It has to be said though there were some outstanding songs including a great rendition of ‘Reet Petite’ and an inspired version of ‘National Express’ by The Divine Comedy which was something that just had to be seen. 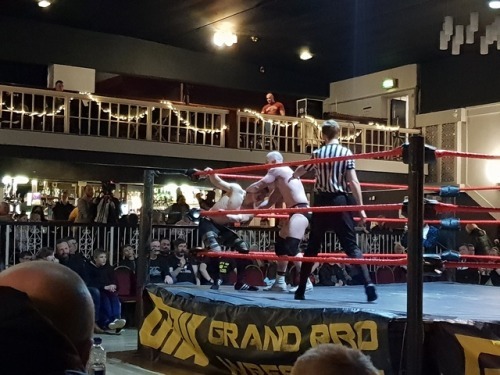 I hope you have all enjoyed reading this review of GPW and I will be back soon with a review of the Schadenfreude (Fight Club Pro) show from Saturday 1st December – so until then BYE! !